In it's 11th year, the JSC Memorial is a unique cross country race in that it is open to all levels of college, college club and open club and unnattached runners in one race. The race honors Jack Saint Clair Jr, a long time runner, HS/College Coach, official and race organizer who also helped design the cross country courses at Belmont Plateau Park. HS and College races have been contested at Belmont Plateau since the early 1960s. The women will compete in the 6,000 meter course and the men will compete over the Liberty Bell 8,000 meter course. Both courses are "true" cross country courses run over a mix of grass, trails and challenging hills that will be a true test for any athlete. MINUTES PRIOR TO EACH RACE. (WOMEN 12 NOON CUTOFF/ MEN 1 PM CUTOFF) STAGING FOR REGISTRATION NEAR FINISH LINE POLES. 12:15 START OF THE WOMEN'S 6,000 METER RACE (RUNNERS ON THE LINE FOR CLERKING NO LATER THAN 12:05) TEAMS WILL BE PLACED IN NUMBERED BOXES. THE 2018 JACK SAINT CLAIR MEMORIAL WILL SERVE AS THE 2017 MID ATLANTIC OPEN (39 YEARS OLD AND YOUNGER) CROSS CHAMPIONSHIP . ELIGIBILITY: The JSC Memorial is open to college teams, open club and unnattached open (no club affiliation) runners. Athletes must be at least 17 years of age and be able to run at faster than 9 minute per mile pace for women and faster than a 8 minute per mile pace for men. (USATF Mid Atlantic members, click Icon above for specifics for your eligibilty requirements). :TEAM SCORING: Teams can have unlimited amount of runners. The top five runners will score. 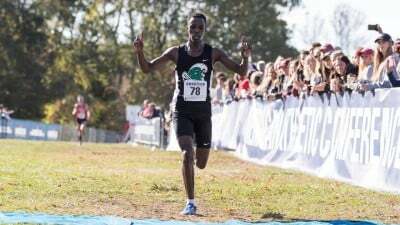 USATF/NCAA cross country rules will apply for the race for scoring and and other rules USATF Mid Atlantic teams will count in the overall team championship and will also be scored seperately for USATF team championship. Teams must finish at least 5 runners to have a complete team in in the race standings. AWARDS: Team trophy to the top 3 teams. The team champion's top 5 will receive team awards. Individual Champion of each race will receive a commemerative award. 2nd - 15th individuals in each race will receive awards. Awards to to the top 2 in the following age groups: 23-29, 30-39, 40-49, 50-59, 60+. Seperate awards also to USATF runners with $50 to the top MW for USATF-Mid Atlantic. USATF runners will also be eligible for Open race awards. for individual and team. AMENITIES: USATF Officials, course marshalls, post race refreshments, bathrooms, and free parking, athletic trainers/EMT, course marshalls on race site. The race is sanctioned by the USATF. Timing by Bryn Mawr Running Company Race is run Rain or Shine. No refunds. ENTRY: 1) INDIVIDUAL RUNNERS (unnattached from a team) entry will be register online with Direct Athletics.If you are not registered as an athlete on Direct Athletics,. A) Go to Direct Athletics and Click on Athlete, Look up Jack Saint Clair Race. B) Click on Race title C) Register your Personal Data on site if you are a new customer to Direct Athletics. D) Pick your race event and register. Entry race fee for individual runners will be $20 pre race online) and $25 if you sign up on race day For those entering online, pay when you pick up your race bib. (check or cash is acceptable on race day- no credit cards). No online payments/Only registration for the race online. Deadline to register online is Tues, Oct 9th at 12pm. 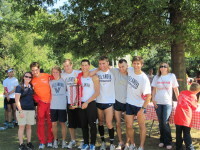 2) ALL TEAM ENTRIES (COLLEGE , COLLEGE CLUB, USATF CLUB) The head coach or club captain will register all team members on Direct Athletics site (www.directathletics.com). lALL TEAMS MUST BE REGISTERED FIRST ON DIRECT ATHLETICS BEFORE REGISTRERING FOR THE RACE. (REGISTER MEN AND WOMEN AS SEPERATE TEAMS). NCAA rules of eligibility will apply for all college teams.. All College coaches/Team Captains will pick up the entire teams race pack on Race Day and PAY the entry fee on race day for teams. $200 per team. (Women and Men team =$400) If your college or club team has less than 6 members, contact Race Director Dave Thomas ([email protected]) for a special team group price of $20 per athlete. Pay by check- No credit cards. ** Unlimited entry per team for the $200 team price. NO TEAM ENTRY ON RACE DAY. Online entry for Teams will close on Oct 9 (Tues). No teams can enter after Oct 9 (only individuals on race day). *** ALL INDIVIDUALS AND TEAMS REGISTER ON DIRECT ATHLETICS ONLINE AND PAY THE ENTRY FEE ON RACE DAY AT REGISTRATION. PAYMENT BY CHECK (PAYABLE TO "BELMONT PLATEAU CROSS COUNTRY HALL OF FAME") OR CASH. OR SEND CHECK TO BELMONT PLATEAU CCHOF /611 JAMESTOWN ST, PHILA , PA 19128 *** You will not be given your race packet until payment is made at registration. RACE DAY SIGN UPS- There WILL BE race day registration for those who did not register with Direct Athletics online. Race Fee on Race Day will be $25. (check or cash/No credit cards). NO TEAM ENTRIES WILL BE ACCEPTED ON RACE DAY. Individual Runners (unnattached) race day sign up will CLOSE 15 minutes prior to your race. The last day to Sign up and register on Direct Athletics will be Wed- Oct 9th at 10pm. TEAMS MUST BE REGISTERED ONLINE ONLY! RESULTS: Results of each race will be posted on the Belmont Plateau Race Board following the race and on the Bryn Mawr Running Company Site, the Belmon t Plateau Hall of Fame Race Page , and Results will be uploaded to the NCAA/TFFR.org site for College Coaches. DIRECTIONS TO BELMONT PLATEAU PARK : From either coming from North, South or from New Jersey: Get on US RT 76 toward Center City Philadelphia. You will take the Montgomery Ave exit (coming from the North, it is the next exit past City Line Exit. coming from the South or Rt 676 (New Jersey), the exit is the next one past the Girard Exit). When you get off Montgomery Ave, head west and Belmont Plateau Park is located on your right hand side about 400 meters after you get off the Montgomery Ave Exit. Parking in lots around the Park. Start /Finish and Registration area at the Tall Silver Poles in the park. Park entrance is the intersection of Belmont Mansion Dr and Army Rd (19131).